The design by New Yorker Bernard Tschumi, born 25 January 1944 in Lauzanne, Switzerland, in partnership with the Athens architect Michael Photiadis, was selected as the winning project in the second competition for the design of the new Acropolis museum. This new Acropolis museum is under construction at the southern base of the Acropolis, at the ancient road (Dionysiou Areopagitou street) that led up to the "sacred rock" in classical times. Set only 250 meter (800 feet) from the Parthenon, the museum is the most significant building ever erected so close to the ancient temple. . Although the return of the Parthenon marbles from the British Museum is not guaranteed, the design includes a rectangular glass gallery that will display the Parthenon marbles with the precise geometry and harmonious dimensions (21x58 meters – 68.9x190.3 ft) of the columned Parthenon. Visitors to the museum will be able to see the Parthenon from the glass gallery. The base of the museum contains an entrance lobby overlooking the Makrygianni excavations as well as temporary exhibition spaces, retail and all support facilities. A wide ramp leads up to the first floor. Transparent sections in the ramp's floor allow visitors to see the exposed archaeological remains below that were found during the preparation of the site. Along the sides of the ramp, and as free-standing installations, there will be artifacts recovered from the Sanctuary of the Nymphs, the Sanctuary of Asklepeios and elsewhere on the slopes of the Acropolis. The middle is a large, double-height trapezoidal plate that accommodates all galleries from the Archaic period to the Roman Empire. 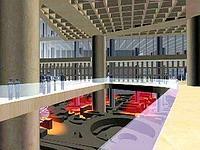 There will be a multimedia auditorium and a mezzanine bar and restaurant with view on the Acropolis. On top is the rectangular Parthenon gallery around an outdoor court. The glass enclosure, with a direct view of the Acropolis above, is designed to protect against excess heat and provide ideal light for sculpture viewing. This gallery, twisted 23 degrees from the floors below, matches the precise orientation of the Parthenon visible from the gallery. The design also incorporates almost 2,200 square meters (23.680 sq. foot) of 3rd, 4th and 7th century archaeological excavations on the building site into the museum as an extended exhibit. The most up-to-date technology and ancient materials will be combined. The two main materials are glass and marble, pre-cast concrete will also be used. Completion of the new Acropolis museum was expected in time for the 2004 Olympic Games but juridical problems and court cases have delayed the construction. Many archaeological remains have been uncovered during the digging for the museum's foundations, not surprising given how close the building site is to the Acropolis itself. Of particular interest to archaeologists is the discovery of an ancient housing complex dating back to the seventh century AD. Other findings go back to prehistoric times. Some experts say this gives a particularly valuable insight into the evolution of Athens and the lifestyle of ordinary people as opposed to the elite. Campaigners took their case to the highest court of appeal in Greece, which ordered building to stop but later ruled in favor of the museum. Supporters of the museum describe all the allegations as nonsense. "Most of what's been uncovered will stay as part of the ground floor of the museum," says David Hill of the British Committee for the Restitution of the Parthenon marbles, who is a regular visitor to the site. "What has been found loose on the ground or uncovered has been catalogued, preserved and will be in the new Acropolis Museum. None of the antiquities will be destroyed or lost.". Museum officials say they've spent more than 13 million Euro over the past five years on the excavation to ensure everything is preserved. In numerous statements, the British Museum has made it clear it will never allow the marbles to be moved permanently from its collection in London to Athens. The Greek Government is suggesting that it should be able to "borrow" the marbles back. The British Museum remains extremely cautious. "Every loan request is considered carefully on its merits," said a spokesperson. "However for conservation and reasons of public policy many loan requests cannot be met.". Despite an offer to send loads of other antiquities to Britain in exchange for the marbles, its official policy is unyielding. Neil McGregor's (the director of the British Museum) latest public statement insists, "Only here can the worldwide significance of the Parthenon sculptures be fully grasped.". Hannah Boulton, a spokesperson for the British Museum, confirmed that the building of the New Acropolis Museum will not change the director's position. For centuries, the British have had high values and morals. These are shown not only in the present Great Britain but also are proven by its own great history and its valuable traditions. However, there is a stain on the Union Jack. Without wanting to go into controversy, the so-called Elgin marbles, actually the Parthenon marbles, should to be returned to Athens. They are a part of the Parthenon and they belong together. On top, they are part of the rich history of Greece that belongs to the Greeks, not the British. What would the position of the British government be if half of the crown jewels, kept in the Tower of London, would be taken by Greece and put on display in a museum in Athens and the Greek government would refuse to give them back? After more then 200 years, it is time to do the right thing. It is time to give the Greeks what is rightfully and historically theirs. It is time to return the Parthenon marbles to Athens. With every day that passes, the stain on the Union Jack is getting bigger as is world support for the return of the Parthenon marbles. Professor Dimitris Pandermalis, Professor of Archaeology at the Aristotle University of Thessaloniki; Director of the Dion Excavations since 1970 and at present President of the Organization for the Construction of the New Acropolis Museum, who has spend seven years getting the new museum built, said: “I don’t care who owns the sculptures as long as they return to the temple the came from.”. For a long time it was said that empty gaps would be left in the presentation of the Parthenon marbles in the hope that Great Britain would eventually fill those empty spaces by sending the slabs from the frieze that are now in the British Museum. Instead of an empty space, Professor Pandemalis intends to exhibit the frieze of the Parthenon with plaster casts of the many friezes still at the British Museum behind a grey screen so that there would be no confusion between the original and the copy. The screen will make the missing part look like a “ghost”, as Pandermalis put it. It also gives the idea that the missing parts of the Parthenon frieze are kept imprisoned in and by the British Museum. In the unlikely event that the British Museum returns the Elgin marbles, the continuous procession that the frieze was meant to depict will still have some gaps. Parts of it were lost in various upheavals, including the conversion of the temple into a church in about 450 AD and a direct hit by a canon ball during a Venetian siege in 1687 when the Parthenon was used by the Turks for military purposes. In the new presentation, those gaps will be used as points of entry into the space. The Greek-owned marbles, which had weathered badly over the years, have all been cleaned using lasers, Pandermalis said. The old museum on top of the Acropolis closed its doors in July 2007 to prepare the works of art to be moved to the new museum. 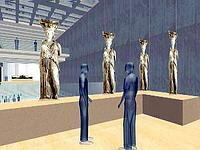 The brand new Acropolis Museum is expected to fully open to the public at the end of 2008. It will house more than 3.000 ancient Greek works of art At the moment you can visit the ground floor of the museum (no exhibits) from Monday to Friday 10:00 to 12:00.